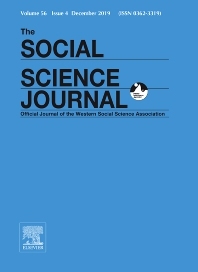 The Social Science Journal is the official journal of the Western Social Science Association. The principal purpose of the journal is to publish scholarly work in the social sciences defined in the classical sense, that is in the social sciences, the humanities, and the natural sciences. The research that is published may take a theoretical or speculative model as well as statistical and mathematical. Contributions are welcome from all fields which have relevant and insightful comments to make about the social sciences. The journal also includes a Research Note section which is devoted to supporting scholarly research that is in progress. The journal has a well-established book review section which reflects the academic and intellectual diversity within the WSSA. While The Social Science Journal is the publication of a regional association, it attracts submissions from a wide range of countries.